This is such a simple idea but so very useful. 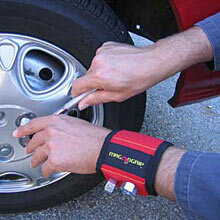 The MagnoGrip, a magnetic wristband. Ok it won’t give you super human powers like Magneto but when it comes to carrying screws, nails, nuts and bolts it certainly beats using your teeth. As I’m currently neglecting renovating my house the MagnoGrip could of saved me so many trips up and down the ladder (as well as chipped teeth). You can get hold of the MagnoGrip from Think Geek for $14.99.